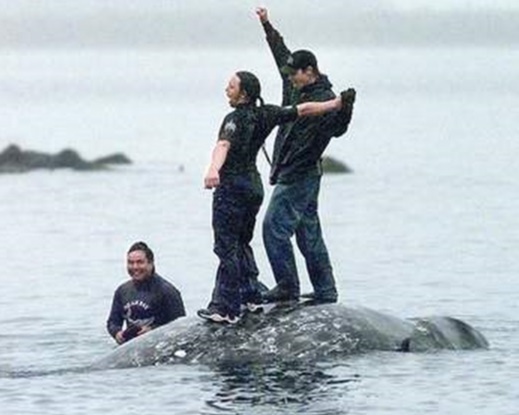 Makah tribal members celebrate on the back of a gray whale killed in the 1999 hunt as it’s brought to the beach in Neah Bay. A baby gray whale was killed in the name of “tradition”by Makah whalers in 1999. Some Tribal Elders decried this killing as “non-traditional” yet today the Makah whalers are on the very of getting a waiver of the Marine Mammal Protection Act to again hunt gray whales. 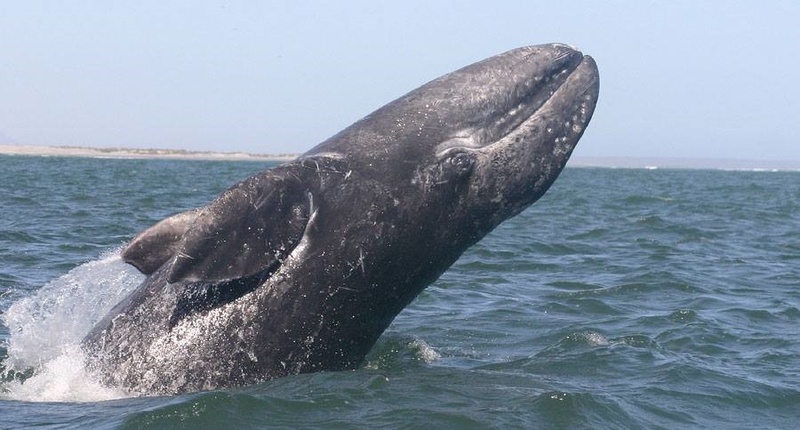 The gray whales who have come to trust us need your comments in opposition now! 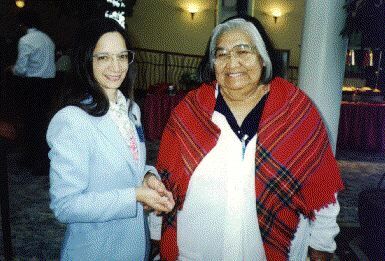 Alberta Tompson, Tribal Elder who vehemently opposed whaling died two years ago. Alberta Tompson tribal elder died two years ago. According to her daughter she was a huge advocate for the gray whale families that visit our coastlines. 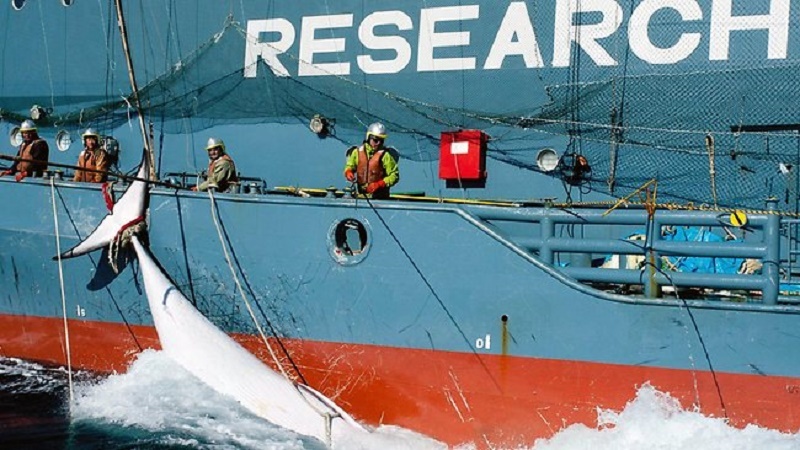 That can be seen in her tireless work to stop the whale hunt. reveals commercial whaling money has played a role in the Makah whalers bid for wavier of the Marine Mammal Protection Act. Why, then, was interest suddenly rekindled in the traditional practice of killing whales? Was it really a resurgence of cultural values, a desire to return to the traditions of the past, or even a desire to exercise treaty rights for the sake of the rights themselves? Again, perhaps in part. But it turns out that the machine behind the renewed Makah whale hunt was not really so much about cultural heritage at all, but about money, politics, and cynical commercial whaling interests from Japan and, to a lesser extent, Norway. As it happens, the Makah tribe was getting along fairly well without whaling, and no one had given the practice much thought in several generations. That is, until Western PR firms working with the Japanese commercial whaling industry (make that the Japanese whale “researchers”) came along. It seems that the PR firms had discovered that whaling could be made more palatable to world public opinion if it could be presented as “culturally significant.” In other words, those PC animal advocates would be reluctant to speak up against whaling if a strong case could be made that the killing of whales is an indigenous right sanctified by the hallowed concept of diversity. To that end, commercial whaling interests from Japan and Norway kicked in tens of thousands of dollars in 1996 to start a pro-whaling group, the “World Council of Whalers” right next to the Makah territory. Meetings began to ensue between the Japanese whalers and receptive members of the Makah, and money began to flow. It was shortly after this that interest in the “cultural right” to kill whales was suddenly reignited in the Makah tribe. One of the first members of the Makah tribe to suggest a return to the killing of whales was one Dan Greene, who suggested to tribal council members that a single whale could earn the tribe a whopping $500,000 if sold to the Japanese. (Although the terms of the agreement that eventually allowed the killing of whales strictly prohibited the sale of dead whales, Greene and others believed it would be easy to get around that little obstacle. Even John McCarty, the former executive director of the tribe’s whaling commission, indicated that he was enticed by the thought of selling whale meat commercially to Japan.) (Source: The Great American Whale Hunt, by Richard Blow, Mother Jones Magazine.) Oh. Did I mention that the Makah Tribe’s whaling commission and expensive entrance into the IWC was founded on money donated by none other than, you guessed it, Norway and Japan? Yes, this is rather important to add. 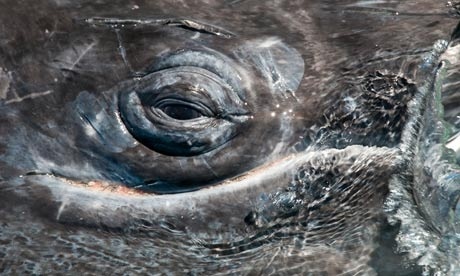 The gray whale never agreed to a treaty that would harm mothers, their babies, and families! Please take action for these amazing beings! Dr Lori Marino, a leading researcher in whale and dolphin brain anatomy, notes that the brains of these species have evolved ‘along a different neuro-anatomical trajectory’ to human brains, but provide ‘an example of an alternative evolutionary route to complex intelligence on earth’. 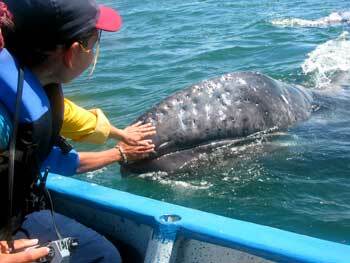 03-06-2013: San Ignacio Lagoon and Petting the Gray Whale Calves. Mothers present their babies to tourists in the birthing bays. Marino further notes: ‘In particular, the cetacean cerebral cortex (the part of the brain involved in higher-order cognition) evolved along a very different trajectory than other mammals, resulting in a highly unusual arrangement of functional areas and an entirely unique structure, the paralimbic lobe. Yet, despite the vast differences in cortical organization cetaceans and humans (as well as great apes) share a number of complex cognitive abilities, such as self-recognition. Cetaceans and humans, therefore, are a striking example of evolutionary convergence in psychology among mammals. These similarities, importantly, mean that cetaceans, as humans, are vulnerable to emotional and social stresses that can lead to considerable harm. This important point is critical to guiding the ethics of how we interact with and treat cetaceans’. A gray whale breaches traveling down the North Pacific coastline. Let us protect the whales and whale watchers say no to request for waiver to the marine mammal protection by Makah whalers! The public has until July 31 to comment on a draft environmental impact statement. Follow this link and comment now! I am writing in opposition to your granting the Makah a waiver, and a permit to hunt gray whales off the Coast of Washington State. You cannot go around the Marine Mammal Protection Act (MMPA) and allow harming these whales who have come to trust humans, and are loved by whale watchers, residents, and visitors that come to Washington, Oregon, California Coastlines on their way to the birthing bays. In 2015 there is no “need” to kill whales. The Makah Tribe has access to food, clothing and traditional history. “Tradition” is not an acceptable excuse or objective reason to circumvent the Marine Mammal Protection Act as it is a subject state. Objective data proves gray whales and all cetaceans to be highly intelligent beings who were almost driven to extinction because of hunting. Today the goal should be to protect and celebrate their existence not harm. If you allow the Makah whalers to kill whales you will be breaking a law, weakening the MMPA and betraying the whales, the whale watching companies and the visitors and whale watchers that bring money into our local economies.To risk the lives of the gray whales, and the lively-hood of whale watching companies, and tourism for an outdated tradition that has no place in a modern world is wrong. Gray whales are highly intelligent and know when they are being hunted. If hunting is resumed the whales may take a different route for migration negatively impacting tourism on the Oregon, Washington and California Coastlines. In closing I want to reiterate that I oppose any permit to allow the Makah whalers to hunt whales in anyway. If you go forward you will be breaking a law and taking away the protections for the Gray Whale and all cetaceans by weakening the validity of the Marine Mammal Protection Act which came about for a reason. It is time to stop all hunting of cetaceans who science has proved are highly intelligent beings, and who already face so many challenges to survive in a modern ocean.